This is the DVD that takes the dread out of Mondays. It shows people how they can work better together within and between teams. Team building is about relationship building and this DVD shows how to do it. It challenges people to be more aware of what makes them tick and how their values and beliefs affect their outlook, attitude and behaviour. How to give an apology. There is a funny side to teams. A group of people trying to work together has great humour potential and paves the way for more fun at work. People have greater success when they have fun or enjoyment. The program has plenty of ideas to get you started. The program balances the serious side of teamwork with the fun side by including stories, humour and laughter. This is a spontaneous question and answer session with the studio audience on teamwork issues. It follows the main program as a separate section. This DVD gives strategies to reduce stress and feel more in control. It captures the dynamics of a studio audience involved in sharing the ideas and the energy of the program. Using a simple chart and everyday examples, the program explains stress and how each person has a choice in how they respond. It demonstrates the mind-body connection and how your mood or the way you feel can lead to relaxation or stress. This fresh insight will challenge you to re-think habits of thought and action that may be creating stress in your life. A special feature is the inclusion of a prescription for good health to better withstand stress, recover from it quicker and have more energy. This is a useful program for people in challenging situations when they need to rise above their circumstances. This hilarious DVD explores the relationship between stress and humour. Stress and humour go well together. A sense of humour allows us to see the lighter side of life’s problems, especially those we cannot change. As you laugh along with a studio audience, you'll discover for yourself the energising and relaxing benefits of laughter. You'll learn where to find and use humour to develop a more playful disposition, boost your sense of humour and get other people laughing. 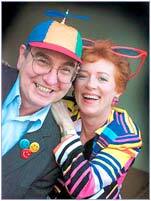 The program is filled with funny stories, practical ideas and props to bring more humour into your life. The DVD can be used as a 'fun break' at home and at work for meetings, training sessions and team building. A positive attitude is too important to be left to chance. That’s because everything you do can be easier and more enjoyable when you’re in a good mood. Being in a good mood can improve relationships, enhance learning, make hard work easier, prevent accidents and reduce stress. There is also a strong connection between positive emotions and good health. Staying Positive is an exciting, energetic and entertaining feast of ideas for getting into a good mood and staying there. By watching this program, you'll be more aware of the times when you may be tempted to give in to negative emotions and what you can do to cut them off and choose more helpful alternatives. How attitudes are transferred in the workplace. Simple, yet effective strategies to lift your mood. The price you pay for being in a bad mood. How to use the power of your mind to see things differently. The value of humour and laughter to relax and feel good. Encouragement and ideas for surviving tough times. How to boost your self confidence to feel good. Laugh as you learn how to see the humour in every day situations. Share the excitement of a studio audience as you enjoy the humorous stories and examples. You do not have to be a comedic genius nor naturally funny to boost your sense of humour. This program can strengthen your appreciation of humour. Share the laughter with friends, family, support groups and co-workers. Men and women laugh at different things. This DVD is a collection of observations, stories and anecdotes that appeal to women. They watch it, laugh and regain the strength to live their busy lives. You’ll discover why women laugh more often than men, and why women are attracted to men who make them laugh. You’ll join in the fun of a typical girls’ night out, when women talk about their lives, share experiences, entertain each other and laugh their heads off. Recorded in front of an enthusiastic audience of women (and a few token men), you can join in the humour, the excitement and the laughs. Get a group together and make a night of it. PG Parental Guidance Recommended. R.R.P. $75. A four part training program with screening guide. This DVD training programme can take the stress out of change. It gives people help and hope. It helps people to make sense of change and what they need to do about it. It restores hope in the future. A future in which they can live with change, enjoy it, and use it to their advantage. The strength of the program is in its simplicity. Complicated models and theories give way to an easily understood A.B.C.D. formula for Coping with Change. Looking for the signals of change. Predicting the consequences of change. Getting more involved in changes at work. Knowing what to read and ask people. Understanding the process of grieving. Using the power of thoughts, beliefs and words. Choosing a positive attitude towards change. Effective handling of self doubt and mistakes. Balancing criticism with achievements and praise. Knowing the value of humour and fun at work. Challenging limiting beliefs about learning. Using practical ideas to make learning easier. Taking advantage of learning opportunities at work. Multi-skilling to secure a future in times of change. Learning how to take action in the presence of fear. Using strategies to get in the mood to take action. Challenging excuses and boosting self discipline. Seeking support from other people. Coping With Change gives people strategies for coping with personal change and changes at work. It is not about how to introduce changes in the workplace, but it will lead to greater acceptance of these. Coping with Change is a unique training DVD style. The content and style is an outcome of extensive research and experience to make an abstract topic pertinent, professional and interesting. This is achieved through using a combination of ideas, stories and humour. Interviews in the workplace (no actors). This simple-to-use DVD training package is in four parts. They can be shown individually or continuously. A facilitator is not required, but would be useful to explore the many "triggers" within the program. The Coping with Change training package includes a comprehensive Screening Guide and Worksheets. The program can be used with or without the worksheets. Time Management For Women. Personal DVD. Most women sacrifice their personal time for the sake of others. This DVD is about questioning unrealistic expectations and standards that lead to women taking on too much. The presentation involves a studio audience of enthusiastic people who are keen to learn how to find more time for themselves. Time for YOU will give you hope, hand hints and restore your sense of humour! You’ll join in the fun and laughter that makes it easier to re-think your life. What to do about that word "selfish". How to break the cycle of doing too much. Ideas for getting help from others. The price you pay for unrealistic standards. Why you can’t "do it all" in a world of rapid change. Creative ways of using time for you when you get it. Presenter: Patricia Cameron-Hill. Produced by Shayne Yates. Consider the convenience of training by DVD. Staff can watch on their own or in a group with a discussion to follow. After two decades of teaching Customer Service in many settings, we have now recorded the best ideas on two DVDs, “Customer Service” and “Tricky Customers”. The information can be repeated as often as necessary. The Seven Service Skills and The Plan for Tricky Customers can form the basis of a standard for your work area. Experienced staff will be refreshed and reminded of what they know and can do. Staff become more aware of their behaviours and the impact on customers. This program shows how to treat customers in a way that makes them feel good. This program features the Seven Service Skills. These are the basic courtesies and people skills that make customers feel important, appreciated and understood. They are comprehensive yet concise and to-the-point and can be used immediately to benefit customers and staff. NEW! DVD Preview - 5 min, 3MB Quicktime file. Each Service Skill is demon-strated in real-life scenes which contrast poor service with good service. This approach makes people more aware of the little things they do and the messages they convey to customers. An insightful commentary is given with a studio audience. This includes a discussion of the importance of having a positive attitude and being imaginative in using the Service Skills. Happy customers are more easily satisfied with products and services. They are more likely to be advocates for your business and loyal customers. The Seven Service Skills take the guesswork out of Customer Service. They give staff a basic level of training in how to deal with customers. Knowing this standard and how to meet it, can reduce on-the-job stress. No one works alone. 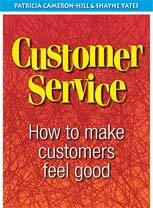 Satisfying internal customers is a vital link in the chain that leads to satisfying the “real” customer. Suggesting an additional product or service is easier using the Seven Service Skills. Making customers feel good on the telephone relies on the choice of words and tone of voice. Most customers notice the way they are addressed. This feature challenges habits of language such as “You right there?” and “No worries” and offers alternatives. This program gives a simple plan for dealing with tricky customers. Many behaviours qualify as tricky. Customers may be impatient, rude, ungrateful, complaining or just hard to please. The behaviour that most people find hard to manage is the angry or irate customer. This program shows how easy it is for the service giver to be drawn into an argument. The focus then moves from the issue at hand to who is going to win or lose. Take the H.E.A.T. is a simple plan for dealing with angry or irate customers. Real-life scenes contrast ineffective behaviours with those used by people who can “take the H.E.A.T”. A commentary is given with a studio audience. NEW! DVD Preview - 4 min, 2.5MB Quicktime file. The techniques in this program will have a positive influence on most tricky customers. They will feel they are being dealt with professionally and the service giver will know they have done their best. This combination will secure the best outcome. Some managers are reluctant to get involved with tricky customers. A retail situation demonstrates the difference between the manager who just observes his staff member and the one who goes to her defence. This uplifting DVD targets the two key issues of service: the attitudes of staff and their behaviours. The information is relevant to all health facilities (diagnostic, acute and aged care) for all categories of staff. 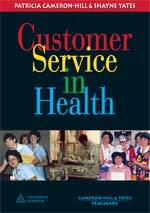 Customer Service in Health includes vignettes and role-plays which are relevant to health care. They contrast poor service with good service. Facts are combined with fun to make learning fast and enjoyable. What all people have in common. The consequences of unthinking behaviour. The behaviours that lead to customer satisfaction. The value of service skills. DVD Screening Guide - This 12 page booklet is packed with ideas to maximise your investment and make screening easier.